Each of the tabs above provides links to information and key components about the UN International Law Commission. The links are principally from the ILC's official website. Explore its history, mission and work accomplishments. For additional resources, both online and in print, available at the Pence Law Library, click on the tab "Books about the ILC". On 3 November, 2016, American University's Washington College of Law's Dean Emeritus Claudio Grossman was elected by the UN General Assembly to the International Law Commission for a five-year term (1 January 2017 to 31 December 2021). For information on Dean Emeritus Claudio Grossman, see his Faculty page at the Washington College of Law. For information on the ILC election process and its membership, see Members. The UN Photos website includes many photos of the International Law Commission, from its earliest date to more recent occasions. At a sub-committee meeting of the International Law Commission. From left to right: John Maktos, adviser to United States representative; P.O. Jessup, United States representative; and Vladimir Koretsky, USSR representative. 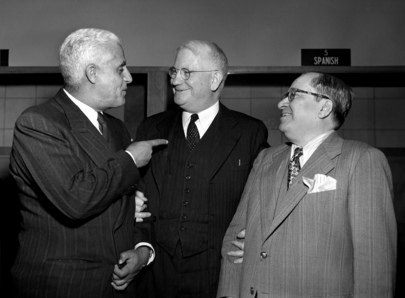 Justice Manly O. Hudson, United States, Chairman of the Commission (centre) is seen with two members of the Commission: Roberto Cordova of Mexico (left) and Ambassador Gilberto Amado of Brazil. The Commission is considering a declaration on the rights and duties of States. A wide-view of the special commemorative event entitled "The International Law Commission: Sixty Years: And Now", on the occasion of the sixtieth anniversary of the International Law Commission. 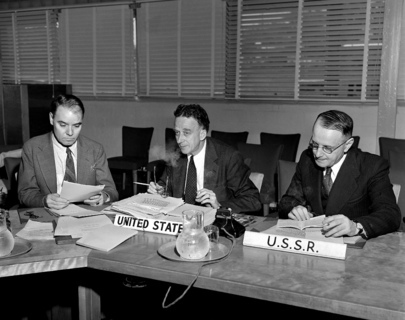 Partial view of the International Law Commission in session under the chairmanship of Professor Manley O. Hudson, United States, who was recently elected to this office. 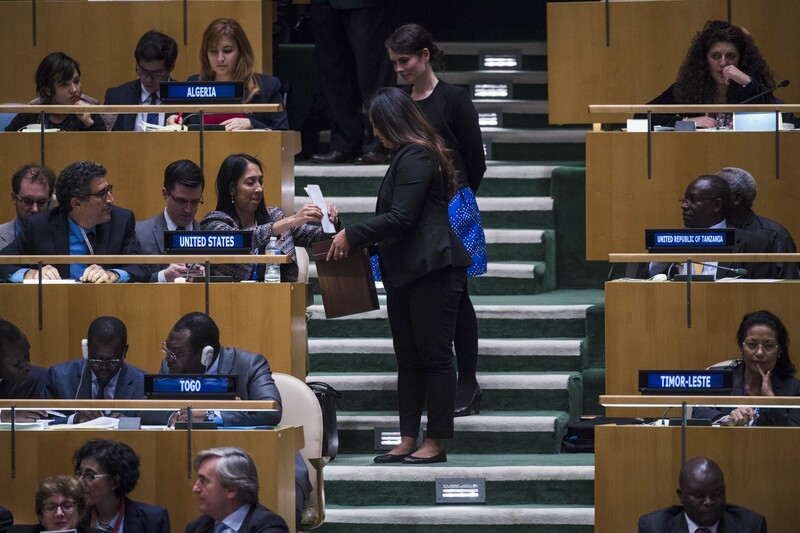 Voting by way of secret ballot, the General Assembly elected 34 members of the International Law Commission, the United Nations organ tasked with the progressive development of international law and its codification. The new members are to serve five-year terms of office with the Geneva-based body, beginning on 1 January 2017. They constitute eight nationals from African States; seven from Asia-Pacific States; four from Eastern European States; seven from Latin American and Caribbean States; and eight from Western European and Other States. A conference officer collects ballots from delegates. (The following information is from the ILC website, with links added). The intergovernmental effort to promote the codification and development of international law made a further important advance with the resolution of the Assembly of the League of Nations of 22 September 1924, envisaging the creation of a standing organ called the Committee of Experts for the Progressive Codification of International Law, which was to be composed so as to represent “the main forms of civilization and the principal legal systems of the world”.1 This Committee, consisting of seventeen experts, was to prepare a list of subjects “the regulation of which by international agreement” was most “desirable and realizable” and thereafter to examine the comments of Governments on this list and report on the questions which were “sufficiently ripe”, as well as on the procedure to be followed in preparing for conferences for their solution. This was the first attempt on a worldwide basis to codify and develop whole fields of international law rather than simply regulating individual and specific legal problems. After certain consultations with Governments and the League Council, the Assembly decided, in 1927, to convene a diplomatic conference to codify three topics out of the five that had been considered to be “ripe for international agreement” by the Committee of Experts, namely: (1) nationality, (2) territorial waters and (3) the responsibility of States for damage done in their territory to the person or property of foreigners.2 The preparation of the conference was entrusted to a Preparatory Committee of five persons which was to draw up reports showing points of agreement or divergency which might serve as “bases of discussion”, but not to draw up draft conventions as had been proposed by the Committee of Experts. Delegates from forty-seven Governments participated in the Codification Conference which met at The Hague from 13 March to 12 April 1930; but the only international instruments which resulted from its work were on the topic of nationality.3 The Conference was unable to adopt any conventions on the topics of territorial water or State responsibility. Although the Conference provisionally approved certain draft articles on territorial waters which later exerted influence to the extent that Governments accepted them as a statement of existing international law, it failed to adopt even a single recommendation on the subject of State responsibility. No further experiment in codification was made by the League of Nations after 1930. 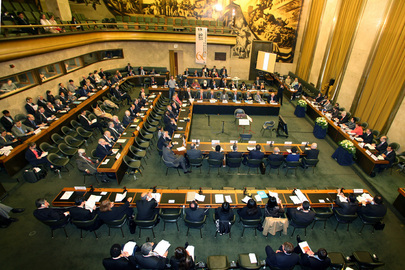 But on 25 September 1931, the League Assembly adopted an important resolution on the procedure of codification, the main theme of which was the strengthening of the influence of Governments at every stage of the codification process.4 This underlying theme was subsequently incorporated in the Statute of the International Law Commission of the United Nations, together with certain other recommendations stated in the resolution, such as the preparation of draft conventions by an expert committee, and the close collaboration of international and national scientific institutes. Each of the topics includes a link to a summary and its entry in the ILC's Analytical Index. The website says " The information on this page reflects the status as of the date indicated, and will be updated three times per year: shortly before the annual session, after the first part of the annual session, and after the conclusion of the annual session."